We are lucky in the UK to have some fantastic coastline, and no more so than the wild and wonderful coastline of North Yorkshire. With over 50 miles of coast taking in seaside towns, quaint fishing villages and dramatic clifftop headlands, the area has something to offer everyone young and old. From Saltburn-by-the-Sea in the north to Flamborough Head in the south, we’ll take a look at 11 things to do on the North Yorkshire Coast. 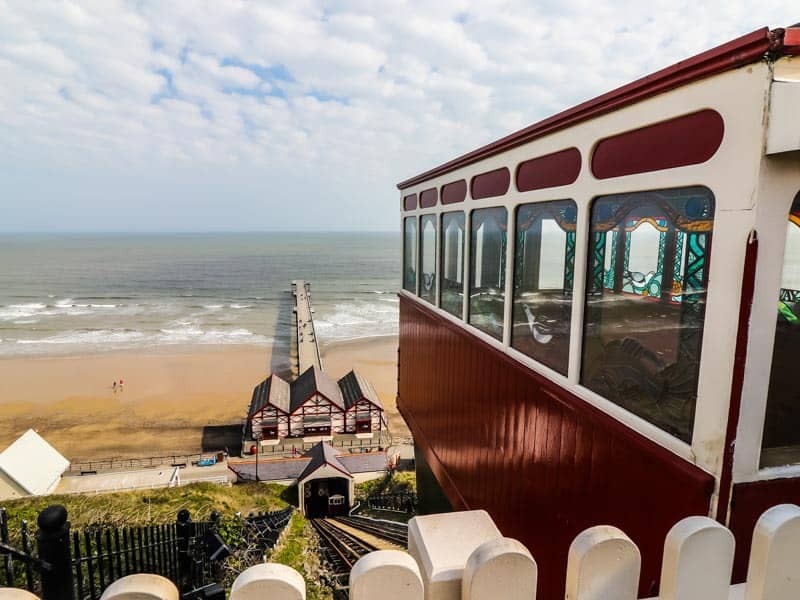 A traditional Victorian seaside resort, Saltburn-by-the-Sea is a very popular destination with tourists due to it’s large expanse of beach and dramatic headland views. The main town centre sits at the cliff top, with a steep bank leading down to the promenade and pier. Rather than walk down, why not opt for taking a ride on the oldest water balanced funicular cliff lift still in operation. Opened in 1884 the lift still carries passengers the 120 feet down to the pier below. The two cars carry 10-12 passengers each and feature beautiful stained glass windows, which add to the Victorian charm. Once down at beach level, take a stroll down the town’s Victorian Pier which has been restored to it’s former glory, and is now Grade II listed. From the end of the pier, the views out across the coast and back towards the town are spectacular. The pier is also a popular fishing spot and features an amusement arcade. High above the town of Whitby stands the ruin of Whitby Abbey, a former monastery that dates back to year 657 when the first building was founded on this site. The ruins we see today are that of a 13th century Benedictine Abbey. Located on East Cliff, the ruins have spectacular views across the town of Whitby and the surrounding coastline. The Abbey can be accessed from the town by climbing up the famed 199 steps which are located in Church Lane. The site also features a visitor centre which is managed by English Heritage, containing items from the Abbey’s history as well as interactive learning elements. There is also an audio tour available that you can listen to while exploring the ancient ruins. The gothic ruins of Whitby Abbey became the inspiration for Bram Stoker’s Dracula novel when he stayed in the town in 1890. Parts of the novel are set in the town and the Abbey is featured. The gothic influence is still maintained in the town to this day, with Whitby renowned as the ‘Goth Capital of the UK’ and holding the twice yearly Whitby Goth Weekend, where thousands of goths from around the world visit the town for a festival of music, shows and quirky costumes. It’s quite the spectacle. The Cleveland Way, maintained by National Trails, is a 109 mile trail that begins in Helmsley on the North York Moors and also takes in the dramatic coastline from Saltburn-by-the-Sea to Filey. This section takes the path along some of the highest cliffs in the country, as well as dropping down into hidden coves, beautiful fishing villages and through some of the larger towns along the coast such as Whitby and Scarborough. Whether you want to take in a small section of the trail, or plan to walk the whole coastline, which is just over 50 miles, the choice is yours. For fans of golf, the North Yorkshire coastline has a huge variety of courses which offer fantastic cliff top views. 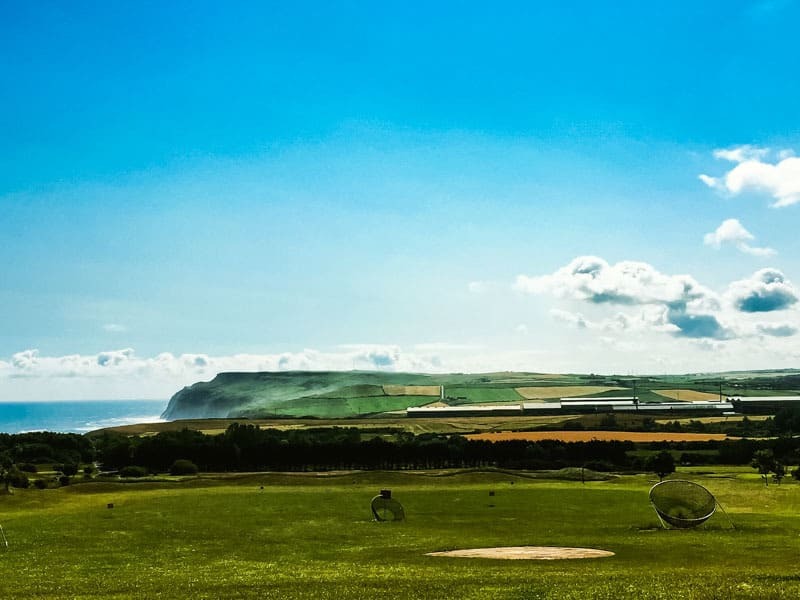 With coastal courses at Saltburn, Brotton, Whitby, Scarborough, Filey and Flamborough, no matter where you are staying there should be a course nearby to test out your putting skills. Not forgetting the kids, there are also plenty of pitch and putt courses and crazy golf courses for all the family to enjoy. The larger courses have a variety of offers and deals available to visitors to the area, and some have driving ranges. With such a charming name, this quaint fishing village a few miles south of Whitby conjures up images of smugglers and sea shanties. A small village packed full of gift shops, cafes and pubs with names such as Smugglers, this place is steeped in maritime history. 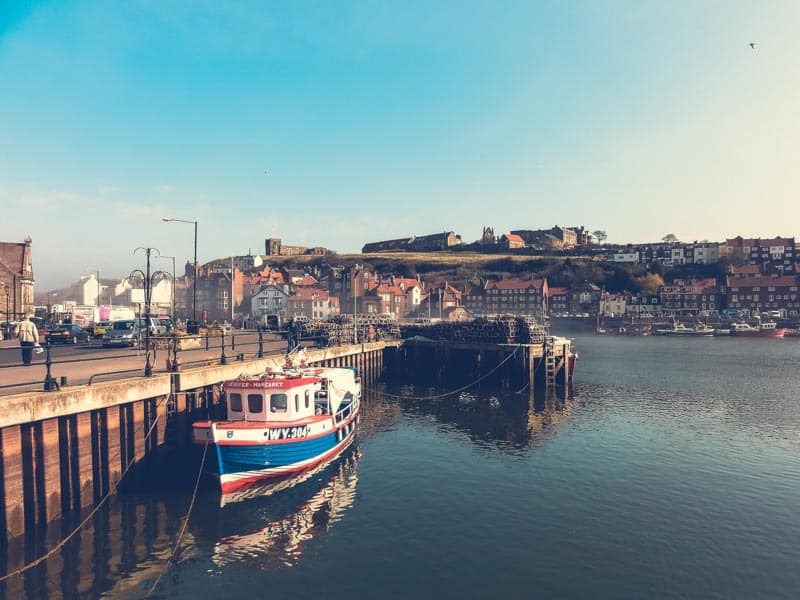 Visit the Old Coastguard Station at the foot of the causeway to the beach which has an interactive exhibition, or head up the steep hills and narrow alleyways to find the Robin Hood’s Bay Museum with it’s collection of local artefacts and history. There is a wide range of accommodation options in Robin Hood’s Bay, from large hotels with stunning views overlooking the coast to tiny and cosy picturesque cottages dotted around the village. There’s a real air of romance about riding on the beach isn’t there. Horses cantering through the surf, wide open space and the fresh sea air – what could be better? The North Yorkshire coast has several beaches which are horse friendly. The long flat expanse of beaches spanning Redcar, Marske and Saltburn provide perfect horse riding conditions, whereas in Robin Hood’s Bay local riding companies offer beach horse riding for more experienced riders with access through the narrow streets of the town. If you are holidaying in, or visiting a seaside town, then it’s customary to have fish and chips at least once. The towns and villages along the coast have a wide variety of fish and chip restaurants, and one of the most popular of these in North Yorkshire is The Magpie Cafe in Whitby. Famed for having the best fish and chips in the area, visitors will queue out onto the street to taste the delicious offerings from the cafe. If you can’t get a table inside, then you could do a lot worse than having a takeaway with views of the beautiful harbour. Once the tide goes out at many of the fishing villages, the beaches are left with an expanse of rock pools to explore. Grab a net from one of the local gift shops and head onto the beach to see what marine life you can find that has been left behind by the turning tides. There is a high chance that you will find some crabs, starfish and sea anemones if you search hard enough. Runswick Bay and Robin Hood’s Bay are perfect locations for rock-pooling, but make sure you check the tide times as it’s easy to get caught out. You might associate surfing with the golden sandy beaches of Australia, or maybe even Cornwall closer to home, but the North Yorkshire coastline is one of the best locations in the UK for surfing and is quickly becoming a rival of those beaches in the South West. Saltburn is now a very popular destination for surfers, with the local geology providing excellent waves and surfing conditions. There are a number of surf schools in the area where beginners can hire equipment and get out on the water to test out their surfing and paddle boarding skills. Not famed for the balmy weather in this part of the world, there is no needs to worry, as the wet suits provided will keep you warm in the chillier months of the year. Visiting the small villages on the coast at any time of the day is special, but given the opportunity it’s definitely recommended to visit when the sun is setting. One of the most picturesque villages in the area is Staithes, a small port and fishing village just north of Whitby. As with many of the villages in this area, Staithes is centred around a small sheltered cove with winding cobbled streets and pretty little cottages, leading up a steep hill to the headland. With ghost walks, lovely art galleries and great restaurants offering the best local seafood, it’s a joy to visit. As the sun gets low in the sky and starts to cast it’s shadows across the village, the cliffs and rooftops glow red while the sky out onto the horizon turns pastel shades of blue and pink. It’s quite a spectacular scene. There’s a great vantage point high up in the town where you can capture the scene in it’s full glory. 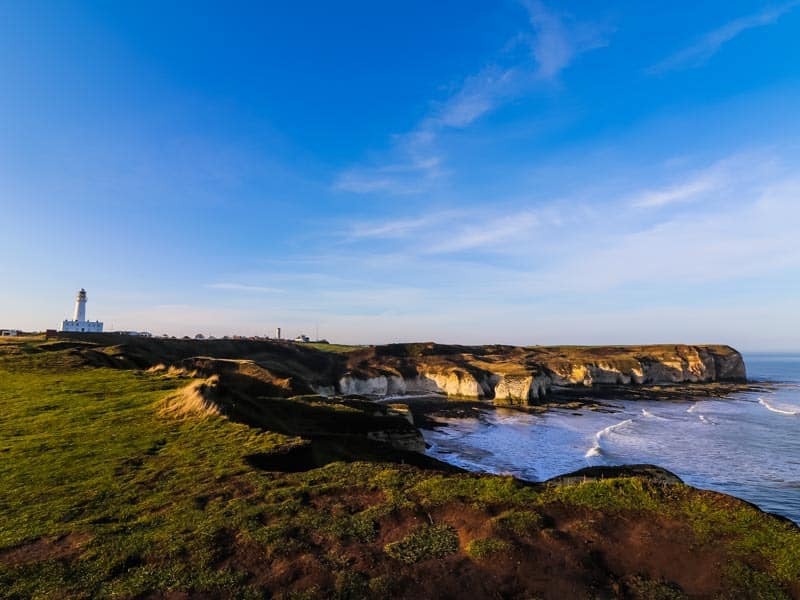 At the southern end of the North Yorkshire coastline (technically it creeps into East Yorkshire), Flamborough Head is a popular destination for hikers and birdwatchers visiting the area. The headland features not one but two lighthouses. The Old Flamborough Lighthouse was built in 1674, whereas the New Flamborough Lighthouse, which still operates today, was built in 1806. The lighthouse and visitor centre is open seasonally for tours for an admission fee. There are cliff top trails around the headland, with steps down to beach to explore the cove. Further north along the headland, the RSPB Bempton Cliffs nature reserve is home to dramatic cliffs where a large number of sea birds gather in the spring. A visitor centre is open seasonally, but the reserve is permanently open to visitors. Want to try these awesome activities? Save and pin it!